Maryland History Day, a year-long educational program sponsored by the Maryland Humanities Council, is a state-wide history-based learning experience that encourages students in grades 6 through 12 to explore local, state, national, and world history. In 2015, the theme was “Leadership and Legacy in History” and included student projects from the public school systems of all three western Maryland counties (Allegany, Garrett and Washington). Many of the projects, whether they be displays, websites, documentaries or dramatic presentations, focused upon African-Americans such as Martin Luther King, Jr., Harriet Tubman, Sojourner Truth, Frederick Douglass, Jackie Robinson and Thurgood Marshall. Harriet Tubman (circa 1820-1913), a former slave from Dorchester County, Maryland who would go on to lead almost 300 slaves north to freedom via the Underground Railroad. Frederick Douglass (1818-1895), a former slave born in Talbot County, Maryland who became an abolitionist, newspaper publisher (The North Star), and orator. Thurgood Marshall (1908-1993), who was born in Baltimore and was an Associate Justice of the United States Supreme Court, serving from October 1967 until October 1991. Marshall was the Supreme Court's first African-American justice. At the state competition a special award sponsored by the Maryland Commission on African-American History and Culture was awarded to a Documentary by an Allegany County student entitled “The Life of Martin Luther King, Jr.”. The documentary was produced by Tattum Logsdon of Allegany High School. In the Garrett County History Day event several projects from Southern Middle School were selected to move onto the state competition. These included an exhibit by Mason Hordubay entitled "The Life and Legacy of Martin Luther King, Jr.", a Research Paper by Brandon Hill entitled "How Jackie Robinson Impacted Baseball Forever" and a Performance by Jenna Griffith, Abbey Sanders and Jessica Storck entitled "Harriet Tubman and Freedom." And in Washington County, two African-American based projects advanced to the state competition. These included a Group Documentary by Emma Weikert and Brianna Simmons from E. Russell Hicks Middle School entitled “Sojourner Truth”, and an individual website by Ryan Franklin of Smithsburg entitled, "Jackie Robinson: Leadership and Legacy in History”. The America's Journey for Justice March was sponsored by the National Association for the Advancement of Colored People (NAACP). It began on August 1, 2015 in Selma, Alabama and concluded with a rally on September 16, 2015 at the Capitol in Washington, D.C.. The march passed through Alabama, Georgia, South Carolina, North Carolina, Virginia and Washington, D.C. for a distance of 1002 miles. The purpose of the march was to focus attention upon having a fair criminal justice system, unfettered access to the ballot box, sustainable jobs with a living wage and equitable public education. The button shown here was secured at a march rally held at the Lincoln Memorial on September 15 and was provided by a member of the Service Employees International Union (SEIU) which was a sponsor of the march. Black Lives Matter is a movement that was established shortly after the July 13, 2013 acquittal of George Zimmerman in the shooting death of an African-American teenager named Trayvon Martin. This incident is described elsewhere on this website. The movement actively campaigns against what it calls police brutality and, though decentralized to some extent, has sponsored protests and events across the country. A recently developed "Black Lives Matter" website identifies the founders as Alicia Garza, Patrisse Cullors and Opal Tometi. It also identifies local chapters and issues the movement is becoming involved in. Some controversy is attached to the organization in that many see it as a civil rights organization, while others view it as a hate group. 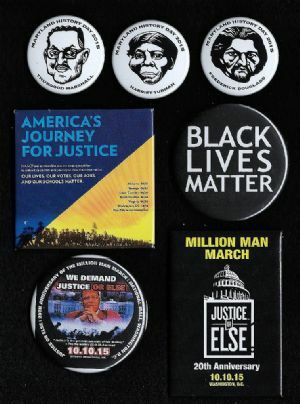 The button shown here was given to one of the America's Journey for Justice marchers (see above) while passing through Georgia. On October 10, 2015 the Million Man March 20th Anniversary gathering was held in Washington D.C. commemorating the original Million Man March that was held on October 16, 1995. The event was organized by the Nation of Islam. Thousands gathered on the West Steps of the U.S. Capitol and the National Mall and heard a variety of speakers, some controversial, who addressed the "Justice Or Else" theme of the rally. Most of the speakers focused on reforming social justice issues affecting the black community. The keynote address was delivered by Nation of Islam Minister, Louis Farrakhan. The button depicted here with Farrakhan's photo was officially approved by the minister for the rally.